In a world full of coffeemakers—percolators, pour-overs and standard automated drip machines—why bother with French presses? Admittedly, they require a bit more active work than other models. 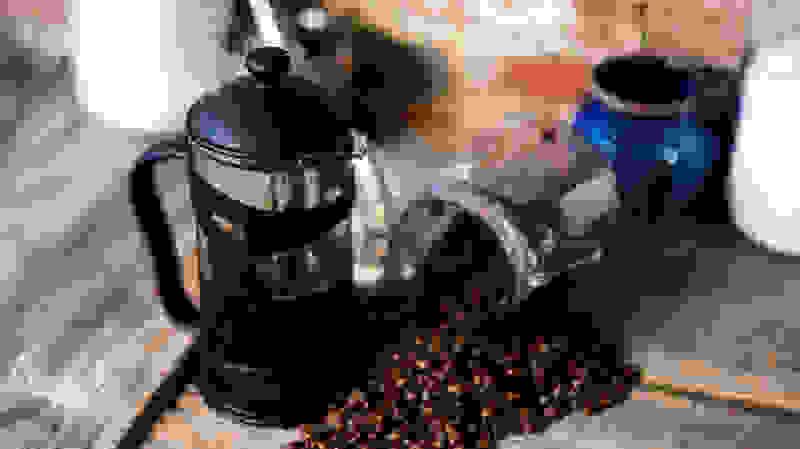 Using them during your morning routine will generally involve water boiling, vigorous stirring, waiting, and plunging; not to mention ideally coarsely grinding your own beans. 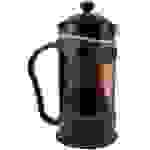 But for that satisfying taste and a barista-worthy cup of joe, many coffee enthusiasts will say, it’s hard to beat a French press. So, which French press makes the best cup of coffee? After researching some of the most popular on the market, we narrowed our search and compared 12 of the best French presses by making nearly 150 cups of coffee. Our favorite? 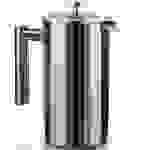 The SterlingPro’s SS Double Wall Cafetiere (available at Amazon), because it’s able to effortlessly turn out sizable amounts of super smooth java (and keep it hot for extended periods of time), at an extremely reasonable price. But it’s only one of the dozen models we tested. Receiving top marks across the board during all of our tests, SterlingPro's double walls provide excellent insulation, meaning the coffee stays hot, while the exterior unit remains cool to the touch (neither of which is guaranteed from other materials). The lid can also be spun around to seal off the pouring spot and hold in heat when not in use. The snugly fitting filter is equipped with double screens, preventing grounds from sneaking into your cup, and every part of the press is constructed from rust-free stainless steel, meaning it would take an act of God for this baby to deteriorate or break. It’s relatively lightweight for a metal model, and easy to operate too; the lid fits snugly, and the plunger pushes down smoothly, without excess effort. It’s a cinch to clean because its dishwasher safe, but not a problem to scrub by hand, as the filters can be removed, and the canister doesn’t include any outer casings to fumble with. It boasts an especially large capacity (holding about six mugs, where the average in this size-class is four), and is multi-use, good for making anything from cold brew to hot chocolate, and produces perfectly frothed milk in seconds. On top of that, it’s available for a great price — while stainless steel presses can flirt with the $100 range, the SterlingPro clocks in at around $30. 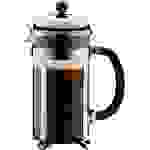 For $20 at Amazon, you can’t ask more from a French press. Kona really delivers with their multi-material model, composed of an easy-on-the-eye, extra-thick borosilicate glass carafe (resistant to thermal shock) which is surrounded by a BPA-free plastic outer shell, that helps insulate and protect against chips and breaks. Those two pieces are fused, which means your hands won’t get scalded if the outer skeleton slips (that does make it slightly trickier to clean, but the whole thing is dishwasher safe). The Kona is light, with an ergonomic handle, tight-fitting lid and smooth-moving plunger, so it’s comfortable to use and hold. And the reusable filters are made of food-grade stainless steel instead of plastic (not often the case with less expensive, glass/plastic presses) that won’t transmit flavors, and are considerably longer lasting. But the thing that really set the Kona apart is its ability to quickly foam milk—something we found near impossible with plastic presses, and quite time consuming with glass. I’m Sarah Zorn, and I’ve been a food writer and editor for almost 10 years. Like most busy professionals, I almost exclusively function on coffee. And testing 1-plus French presses almost allowed me to hit my daily quota of caffeine. We made three separate batches of coffee in each machine, using the same method (3 cups boiling water to 1 tablespoon coarsely ground coffee. Combine in the canister, stir thoroughly, let sit for four minutes, and plunge). We assessed subjective questions, such as how easy it was to use the press and plunger, how comfortable it was to hold and lift the press when full, and how simple the press was to clean. We also addressed objective questions, including if there were any grinds in our coffee, the quality, build and durability of the press, whether there were visible measurement marks, if we had any safety concerns, and our overall experience with each unit. We also evaluated how easy it was to froth milk in each press, using the same method (heat 1 cup of milk for 40 seconds in the microwave, place in canister, and plunge 30 times). Patented back in the 1920’s, the current design hasn’t changed much over the years. 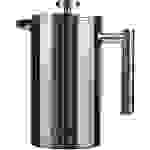 Basically, French presses consist of a lidded canister (made of various materials), fitted with a retractable plunger equipped with metal or plastic filter. After sitting for four minutes or so in heated water (approximately 200 °F), the plunger is used to press and trap course grounds against the canister base, extracting flavor into the water that surrounds it, while the filters prevent spent grounds from escaping into your cup. So why go the French press route? While paper filters used in other coffeemakers aid in cleanup, they also prevent the tastiest coffee bean oils and essences from making it into your mug. 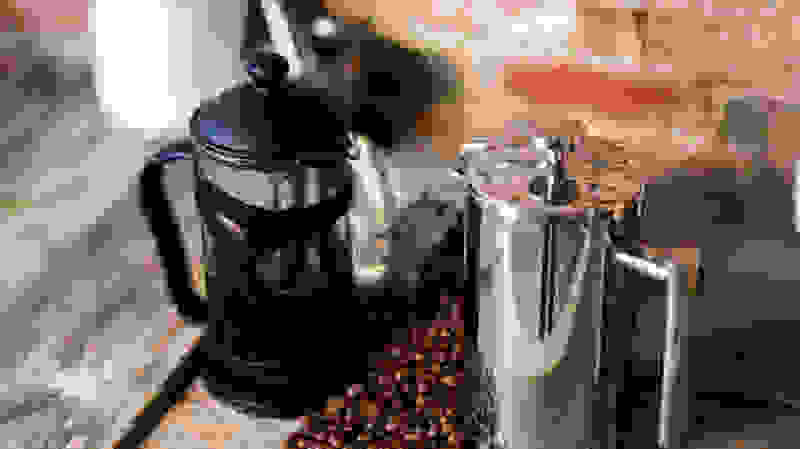 Other kinds of coffeemakers like percolators and drips operate in heat extremes—they come to a boiling point in minutes, then precipitously drop. 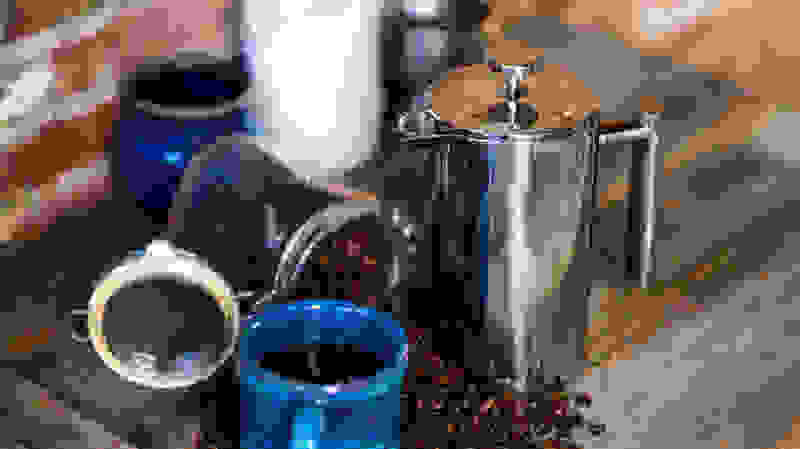 The slow and steady nature of the French press is precisely what makes the most of the coffee beans; treating them like tea by allowing them to steep before sipping. And in addition to being pretty (and sounding fancy), French presses (known as cafetieres in Europe) actually come in a range of wallet-friendly prices. You can spend as little as $20 for a brewing machine that makes tasty coffee, takes up less counter space, and is more portable than percolators, pour-overs or drip hardware. The primary factor that sets French presses apart from each other is what material they’re made from: stainless steel, glass, plastic, or stoneware/ceramic. So, it’s up to the purchaser to decide where their priorities lay when it comes to selecting one. (As is size. two, eight and 12-cup capacity are the most common). Stainless steel has excellent heat retention and is generally the most durable. We’ve also found that it’s the best performer by far for frothing milk. Stainless-steel presses tend to be expensive though, are rather heavy, a touch less attractive, and you can’t actually see the coffee inside. Glass is attractive and lightweight and generally doesn’t transmit off flavors to the coffee. 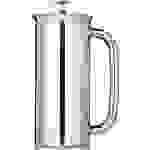 Depending on the model, however, the outside of the carafe often gets hot to the touch, increasing the risk of scalding and burns. They also break easily. Look for models with an outer frame (either metal or plastic) that will help guard against burns and increase durability. Plastic (it’s best to look for BPA-free) is inexpensive, lightweight and portable, making presses easy to take on trips or to the office. It doesn’t break as easily, but lower-priced models often aren’t made from especially durable parts, so the mechanisms can break down over time. Look for models with an outer frame (either metal or plastic) that will help guard against burns and increase durability. Stoneware and ceramic looks beautiful in the kitchen, doesn’t transmit off-flavors, and has pretty good heat retention (although again, be careful of touching the carafe with your bare hands). It’s highly breakable though, and heavy, especially when full of coffee, so dropping could be disastrous. Stoneware/ceramic models also tend to be on the expensive side. In addition to the materials the carafe is made of, it’s also important to assess the plunger, which is instrumental to using a French press. It should move up and down easily, and the filter should ideally be made of metal, not plastic, as it’s much more durable, and won’t corrode or bend (especially when put in the dishwasher) over time. 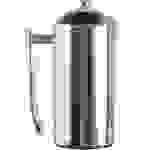 Speaking of dishwashers, because of all their parts, French presses can be tricky to clean. So look for models that are dishwasher safe, or allow the filter to be separated from the plunger, so you can effectively remove the coffee grinds. Espro P7: Though amongst the more expensive models we evaluated, this beast of a machine is built to stand the test of time. 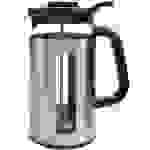 Made from double-walled, vacuum insulated stainless steel, it kept our coffee piping hot, without leaching any of that heat to the outside carafe. And while escaped grounds can often be a downside of French presses, the Espro has a unique duel filtering system, that produced the smoothest java we tried. A pair of BPS and BPA-free micro filters come with a double-lip seal to prevent over-extraction, and unsavory grit from sliding into your cup. Ideal for coffee on the go, OXO's feather-light Venture is crafted from shatterproof, BPA-free Tritan plastic, with a comfortable to hold handle and easy to depress plunger. The spout has a filter, which helps keep out stray grounds and prevents splashes. The entire unit is dishwasher safe, making it easy to clean. It's super affordable, but might not last for an especially long time, considering its silicone-ringed filters. The gleaming Frieling has the benefit of excellent heat retention, thanks to the double-walled, durable, high-quality materials used. There’s little chance of escaped grounds, owing to a two-stage duel screened filtration system. All parts can be disassembled and put in the dishwasher for easy cleaning, and the model boasts a 5-year warranty against defects. The downsides are that it’s definitely heavy and somewhat pricey, and the plunger took a lot of muscle to press. So, while the foamed milk it produced was perfect, you’ll expend some energy getting there. Comfortable to hold, seamless to use, affordably priced, dishwasher safe, shatter-free and BPA-free, Bonjour’s Ami Matin offers everything you’d expect of a plastic French press. And it even does your classic model one or two better, by coming in an array of colors, and with a filtering lid to reduce sediments, and a shut-off infuser that stops the brewing process and locks in flavor. It should be noted that there’s a decent amount of negative customer feedback, regarding long-term durability. And—like most plastic presses—it struck out big time when it came to frothing milk. 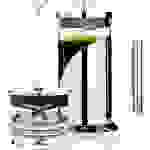 The benefit of the Brazil is that it’s made from a composite of materials, representing the best of each; a glass carafe for clean flavors and aesthetics, a BPA-free plastic lid, handle and base for comfort and durability, and a stainless-steel filter and plunger that won’t corrode over time. And they’re all dishwasher safe. Nevertheless, it’s important not to touch the carafe (as the heat bleeds through), it’s still subject to breaking, and it doesn’t have much in the way of a filtration system, like the aforementioned presses. There’s also no cover in front of the pouring spout, meaning the coffee quickly loses heat. Café du Chateau French Press: The primary selling point here is a four-level filtration system, consisting of a pair of stainless-steel screens, a spring-loaded base that seals the edges during pressing, and a strainer in the lid, as a final defense against escaped grounds. Keep in mind that the outside—consisting of a glass canister with stainless steel exterior—gets plenty hot, so you’ll need to be careful when handling. 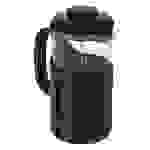 Additionally, it only comes in one capacity (34-ounces), and all of those filters can be difficult to separate, and thus, to clean. For a model that uses stainless steel in both exterior and interior construction, the price point for the Secura is surprisingly low. There’s a three-layer filter to guard against grounds, plus a bonus screen that can be stacked against that, to produce an even smoother cup. Detractors are that it’s definitely heavy when filled, and the lid didn’t sit perfectly flush against the carafe, making plunging very wiggly and difficult. The most attractive model we tested by far (it’s Le Creuset after all), you won’t mind keeping this aesthetically pleasing press on the counter or bringing right to the table during dinners or parties. While most French presses come in basic black or stainless steel, you can choose from an array of colors like Provence Purple, Cherry Red, Soleil Yellow or Caribbean Blue, all of which are odor and stain resistant and dishwasher safe, with stainless steel plungers and presses. 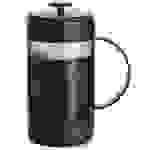 That said, these are very heavy, the carafe can get hot, and the lid tends to slip while pouring, leading to breakability and safety concerns. Featuring a tempered glass body with a stainless-steel outer cage, this OXO entry produces a clean-tasting cup, that holds temperature well. That said, this was one of the rare instances where a few grounds found their way into our coffee. And despite efforts, the Easy Clean can actually be a headache to clean, as the grounds “lifter” (a sort of flat-bottomed ladle, that sits inside the carafe) tends to drip grit back into the unit when you attempt to raise it—or even more frustratingly—all over your counter or floor. And more parts to deal with means more parts to clean; a bummer, since hand washing is suggested. 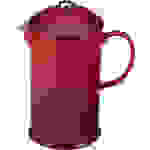 Lightweight and nice looking, the Chambord sports a classic French press construction, with a glass carafe and footed, stainless steel cage frame. 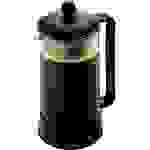 But while you’ll find it on many “best of” lists, we can’t say we’re believers in Bodum’s top-selling model. The glass carafe regularly slipped out of its (somewhat flimsy) steel skeleton; raising all manner of red flags as far as safety is concerned. And if you don’t realize that the shell (to which the handle is attached) has shifted around, you may find yourself pouring with the spout turned to the side, sending streams of hot coffee onto your arm instead of into your cup. The plunger also sits awkwardly inside of the carafe, further deducting points for ease of use.